30 Days of Get Your Art On! I ran across this blog post this morning from Traci Bunkers, author of The Art Journal Workshop. If you are having a difficult time setting the intention of doing art or being creative, here's a great plan. She suggests the following guidelines. Don't feel you have to finish what you're working on that day, just work on something. It doesn't matter what you do for the art making, as long as you work on art. Don't fee guilty for taking the time to work on art and no need for justification of why you're doing it. 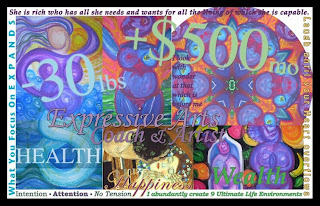 When I created this vision board, I combined some of my art, a digital mandala I crafted from the Blue Woman painting, a favorite print image, and several quotes that inspire me. I also added happiness, health, and wealth - I choose an action every day in each toward long term goals. I keep this image on my laptop screen as well as a print in my office at home and at work. I created my first vision board over 6 years ago, and everything on the board, including some things I didn't purposely intend, have flowed into my life. My daughter posted on facebook yesterday that she is going to help my granddaughter create a vision board so they can both have one to put on their wall. Makes my heart happy. Can't wait to see what they come up with.